The heart of the restaurant is a special wood-burning pizza oven from the city of Modena (Italy) where guests can watch their pizza baking. This is the guarantee for the crisp and delicious „XII Apostel pizza“ made according to an original Italian recipe. The XII Apostel, a restaurant that truly has something for everyone: pizza and pasta for families with kids, a trendy overall concept that attracts lounge fans, and simply the best pizza in town for those in the know. A special spot for everyone in Cologne. The XII Apostel Restaurant on Heumarkt offers the appealing ambience of an aristocratic baroque palazzo -- something you won't find anywhere else in the region! 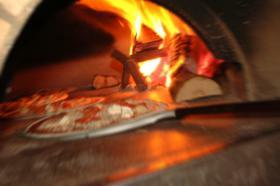 The heart of the 600-sqm eatery is the wood-burning pizza oven from Modena (Italy). It is this oven that guarantees the crisp and delicious „XII Apostel pizza“, made according to an original Italian recipe. Find out which is your favourite pizza! You can also choose from a variety of Italian pasta, fish and meat dishes. The wine list will likewise thrill you: exclusive Italian wines, to test by the glass or bottle – at fair prices. 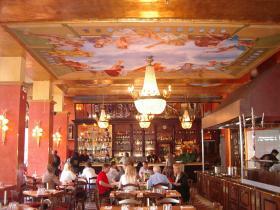 Enjoy the one-of-a-kind atmosphere with splendid ceiling frescoes, hand-carved beams and high mirrors. Journey to Italy, spending an evening in what feels like an Italian palazzo! Whether you plan a candlelight dinner for two, simply have a hankering for pizza, whether you come for lunch, brunch on Sunday, a company party or a private function – at XII Apostel you have come to the right place. Welcome! 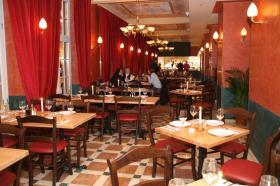 A table reservation or the booking of a menu/ offer is in the "XII Apostel" via GlobalGuest always for free you as a guest!